Our mission is to help create well rounded horses that are able to go on to do any discipline or job and achieve that perfect equine relationship. Your exclusive on-line Liberty Training Video Library! The Pathway to Liberty Online series is designed for experienced horse people and trainers. The material covered in this exciting new series was previously only available through clinics. But now you can access it at any time on your phone or computer. Learning how to train a Liberty horses can open the door for many opportunities and take your relationship with your horse to a level that you never knew existed. 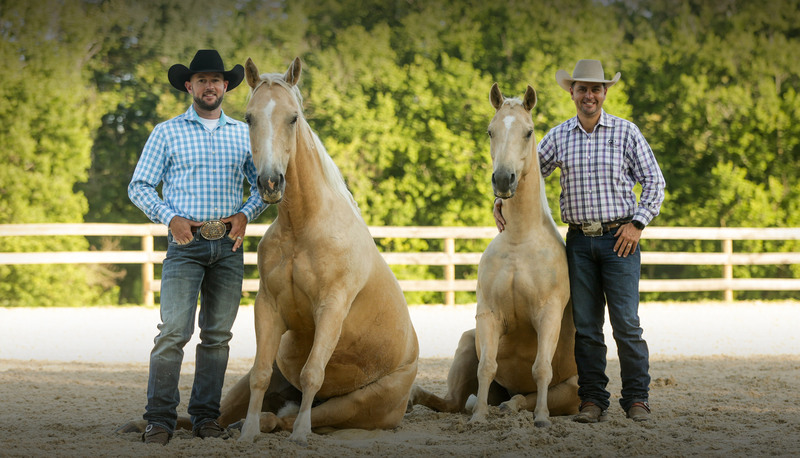 Whether you want to become a movie horse trainer, perform in live shows, train your own Liberty horse, or just gain a unique understanding of how to teach your horse the art of liberty training – this is the series for you. To gain the most out of this series, we strongly recommend that you attend a ground control clinic or watch our Ground Control – Level 1 DVD first to build a strong foundation and better understand the specific cues used. The Pathway to Liberty Online series is seperate from the Double Dan Insiders program. In order to access the Pathway to Liberty Online training videos, you must purchase access from our online store. In Level 1 you will learn how to build the solid Liberty foundation needed for more advanced Liberty training. This Level includes 7 videos in which Dan James shows you step-by-step how to teaching your horse mark training, how to start a horse working around you at Liberty, how to teach them to change directions, and how to start integrating cues. Dan demonstrates numerous exercises using both beginning and advanced Liberty horses to show you what to expect, what the progression looks like, where to stand in relation to your horse and how to use your body effectively. Dan also discusses common problems you may encounter along the way and how to correct them. There is no skipping Level 1, it is the basis of everything else you will achieve on the Pathway to Liberty. In Level 3 you will learn how to work your horse in much larger areas and how to start adding other horses. In this level, Dan James will teach you step-by-step how to develop the draw and how to add distance. Level 3 will really start to test you and your horse on how well your foundation was taught and understood. You will learn how to take your earlier mark training and body control and start to add long distance. In Level 4 you will build on the strong foundation built in Levels 1, 2, and 3 and learn how to introduce to the horse such things as the rear, the Spanish Walk ,the sit , the lay down, and so much more. Dan James will show you step-by-step how to teach your horse to pick up and carry objects, how to add jumps, and how to integrate other skills that the horse may have such as the spin or lead changes all at Liberty! In Level 5 you will learn how to combine everything you learned in Levels 1-4 and start successfully working your horse at Liberty while riding them. We highly recommend that you have confidently finished our Body Control Under Saddle – Level 3 before beginning Level 5. This Series is now taking all the skills that you and your horse know and putting it all together. At this stage there can be new tricks and more multiple horses added. Acts? At the end of successfully completing series 5 you are ready for the live show arena, or on the film set, and if those two parts are not for you, you and your horses will have so many things to experience and explore in the art of liberty. How to teach a horse to rear is one of the most common requests Double Dan Horsemanship receives…and now it is all available to you on your phone or computer! In Teaching The Rear, Dan James teaches you step-by-step how to correctly teach a horse to rear using the safest technique for both horses and humans. Building on the stop cue learned in Level 2, this video will not only show you how to train your horse to rear on command but will also demonstrate how to do it on the ground, at Liberty, from different positions, at varying distances, and with a rider on the horse. If you’ve ever wanted to teach a horse to rear or simply want to learn how it is done this video is for you!